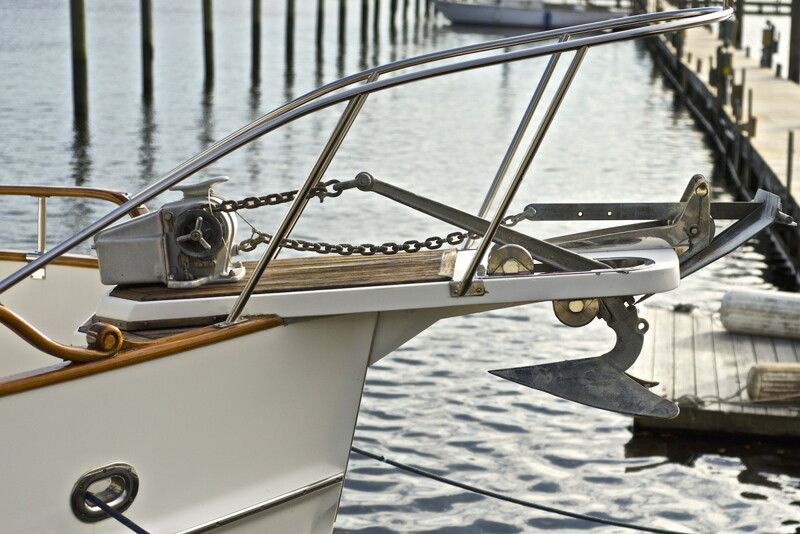 When it comes to deck gear, electric and hydraulic anchor windlasses are considered critical and necessary by most cruisers. Most would choose to not get underway if their windlass isn’t working properly, and wisely so. Being able to set, and retrieve, ground tackle is one of a prudent mariner’s vital, emergency fall back actions. 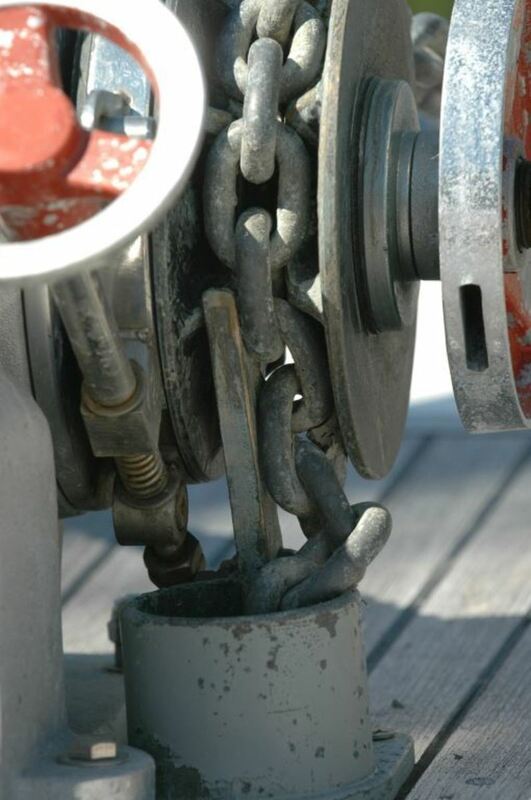 If a propulsion or steering system fault develops while entering a harbor or transiting a channel, one of the few options available to the vessel’s master is dropping the anchor, preferably without too much difficulty or delay. By the same token, the well-being of a vessel and her crew may also depend on being able to quickly and easily retrieve ground tackle; in the event your anchor drags while on a lee shore for instance, or should another vessel drag or drift down upon your vessel. In many cases, when I encounter a windlass that isn’t working properly, or one that I believe will fail to operate properly when called upon to do so, the culprit is either a failure to follow the manufacturer’s selection and installation instructions, or a failure to carry out proper maintenance. This chain is clearly jammed in the chain pipe, a result of an improperly aligned chain stripper. The primary selection fault involves selecting the appropriate size or capacity of the windlass. Most windlass manufacturers offer helpful guidelines for making this decision. Perhaps among the most important selection criteria is the ability to retrieve the entire length of rode if it is deployed in deep water. The windlass must have enough power to retrieve all of this weight, as well as the anchor. “How often is every so often,” I queried, “oh about every third or fourth time,” he answered. With that exchange I learned a valuable lesson, testing is critical. Installers and boat owners, new and used, take note, testing an installation for proper alignment involves a minimumof ten consecutive successful deployments and retrievals, using a minimum of 50-feet of rode. If a jam occurs, even once during this test sequence, a close investigation is warranted. For electric windlasses, avoid carrying out the test back to back to prevent windlass motor overheating. Most motors utilize a thermal cut-out that will disable the motor until it cools. This windlass faces a host of installation defects, the flange is not seated against the deck, the fastener hole is too large and the flange is heavily rusted. The loads placed on windlasses are often significant and thus the method used to secure it to the deck must be equally robust. Through-bolts that are the largest that will fit in mounting holes, along with a substantial backing plate or plates that are at least as large as the footprint of the windlass base are prerequisites. Backing plate material should be stainless steel or, most preferred, GPO-3 fiberglass sheet, the thickness of which is dependent upon the size of the windlass. 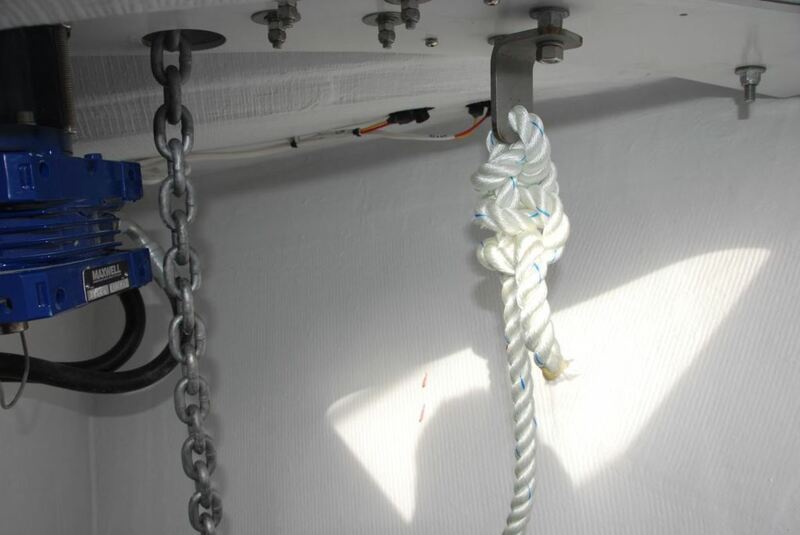 This windlass relies on a proper, fiberglass backing block to spread its loads over a larger area. 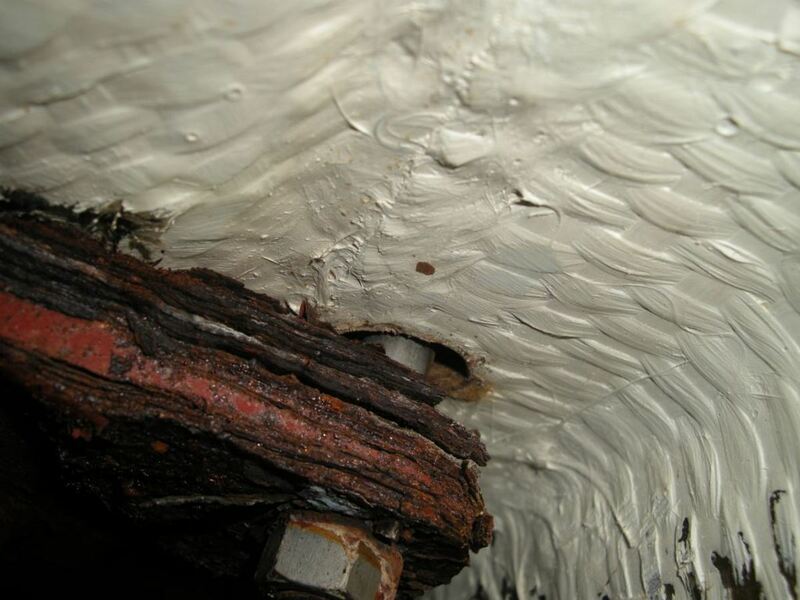 An equally common installation fault involves the wiring, both primary (the large cables that supply the windlass motor) and secondary (the smaller wiring connected to switches). Electric windlasses should always be wired in accordance ABYC guidelines, preferably using a 3-percent, but no more than 10-percent, voltage drop calculation. The greater the voltage drop, the less efficient the motor is, and the more heat that’s generated within the motors windings. This comes with a consequent decrease in its lifespan. Another common and potentially disastrous installation flaw involves placement of the fuse or circuit breaker. It must be located within seven inches of the battery (40” if the cabling utilizes supplemental sheathing), and notnear the windlass. Fuses or circuit breakers are also required on secondary or switch circuits, a frequently overlooked yet important detail. It’s important to remember the primary purpose of a fuse or circuit breaker is to protect the wiring in the event of a short circuit. If the windlass is equipped with the aforementioned fuse, as opposed to an easily accessible circuit breaker, then an easily accessible disconnect switch should also be included in the circuit. 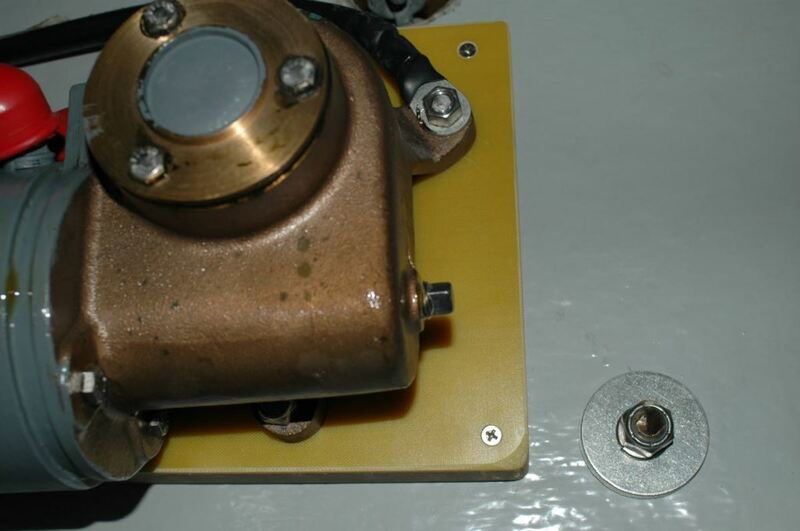 This would be used in the event the windlass suffered a malfunction, as in – it won’t stop running - (this often occurs as a result of water intrusion into deck or fly bridge mounted secondary circuit switches). Finally, the bitter end of a chain rode should be affixed to the vessel via a section of three strand nylon “cut away” line, which can be used to release the rode in the event of an emergency, i.e. you’re dragging onto a lee shore or you’re about to be rundown. Exposing this line enables it to be quickly and easily cut. Using a cut-away line, like the one shown here, between the bitter end of the rode and the vessel makes good sense, it enables the crew to quickly cast off the rode if the vessel is dragging onto a lee shore or if she is being born down upon by another vessel and there’s no time for retrieval. It’s important that the cut-away line not jam, it must fit through the chain pipe with ease.